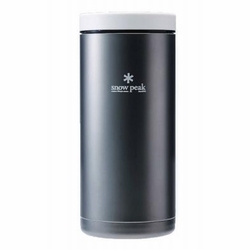 A lightweight enthusiast's dream, Snow Peak Kanpai Vacuum Insulated Titanium Bottle is a titanium double-walled, insulated container. The Titanium Kanpai bottle is vacuum sealed bottle that comes with three different lids. The cold lid features a gel pack that when frozen will keep an entire canned beverage cold. Use the insulated thermal lid to keep liquids hot and use the Tumbler lid to turn your Kanpai Bottle into a convenient travel mug.